ICOM introduced for the first time "Dual-Watch" architecture in IC-781 model. This is a very practical compromise which offers limited dual-receive capability. It eliminates the complexity and costs associated with a second IF chain and demodulator. Part 1: Exotic circuitry and hard-to-find components aren't necessary if you want to build excellent performance into a home-brew SSB/CW transceiver: Careful design is the key. Part 2: This moth, W7ZOI rounds out his description of a 1- or 10-W SSB/CW rig with details on its transmitter, TR switching and optional speech processor. 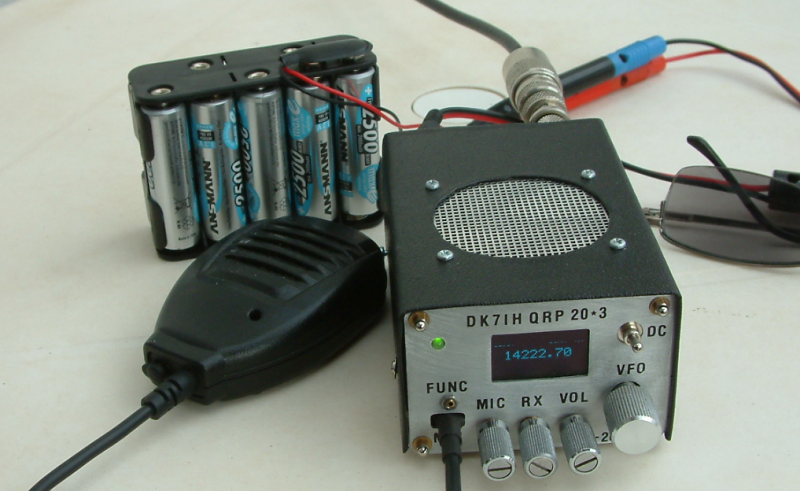 A dual-band transceiver with a crisp receiver and a clean SSB signal is described. It started its life as an investigation of the excellent S7C receiver described in EMRFD. 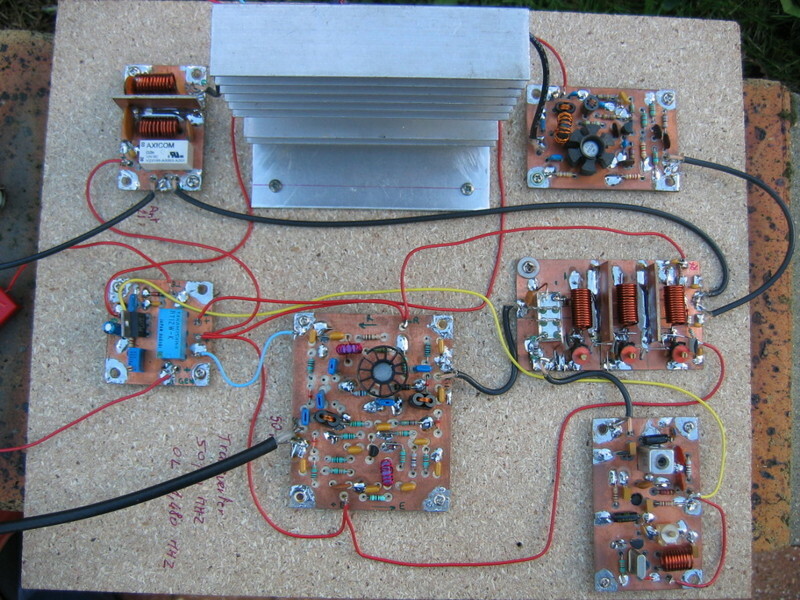 The original "unique" PSK transceiver proved that an efficient Class C power amplifier can be used to transmit PSK signals, although it requires a bit of front end circuitry to do so. 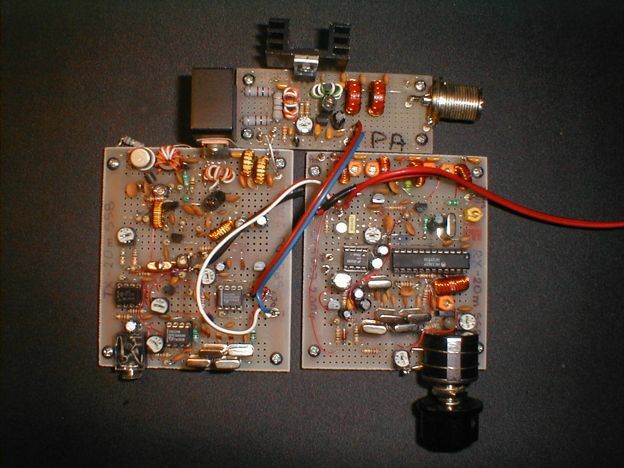 This transceiver is a new version of a rig published in AN-EP, a traditional brazilian Ham magazine of 1992, march / april issue by Carlão PS7PC. BITX is an easily assembled transceiver for the beginner with very clean performance. Using ordinary electronic components and improvising where specific components like toroids are not available, .. While surfing around the 'net I came across WA6OTP's website. Now I've seen PTO based VFOs before, but his implementation is very simple and elegant. I just couldn't resist the urge to build one myself and try it out. Output power is now only 4mW, from the Re-used input RF amp that also works as a filter, to only amplify the wanted difference from the mixer, not the sum. When Aquarius project became more popular many QRP-ers asked me if I could develop simple ( means duplicable) SSB version of low cost QRP transceiver. After having built my first shirt-pocket transceiver about a year ago I occasionally thought of how this or a more or less modified design could be made simpler to save components and therefore limit space as well as reducing the complexity of the whole rig. Utilisé conjointement au transceiver 50 Mhz décrit dans ces pages, ce transverter redonnera vie à la station 6 M non utilisée . Cela concerne notamment les longues périodes durant laquelle la bande est déserte.